Blackberry Smoke looks like they just stepped out of a 1960s promo photo shoot — wardrobe, hair, and all — that one where the band Blue Cheer posed on a pier with their mountain of amplifiers. 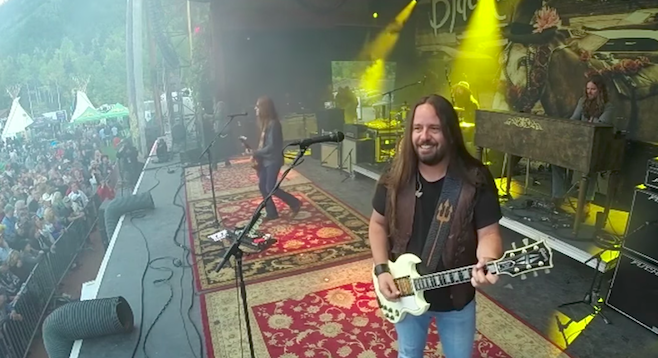 No, Blackberry Smoke doesn’t sound like Blue Cheer, which was a very loud band that played a hand in the invention of heavy metal, but Blackberry Smoke members do look the part. Monday, July 24, 2017, 8 p.m.
I’d be hard pressed not to call them a reasonably amped-up alt-country band (they actually show up on country, Americana, and on rock-music charts), but there’s much more to the Smoke’s construction, including gospel and kind of a hybrid Southern rock à la the Allman Brothers band, or even the Black Crowes. You could call it American rock and not be far off the mark. I first saw this band in a tiny nightclub, crammed onto a stage designed with trios in mind. That had to be at least five years ago; they’ve since road-dogged their way up the food chain and now fill decent-sized halls on their own. From Atlanta, Georgia, they are a traditional rock-and-roll five-piece with drummer Brit Turner, Paul Jackson on lead guitar, Charlie Starr out front on vox and guitar, bassist Richard Turner, and Brandon Still on keys. Blackberry Smoke earned a multitude of their fans by opening for arena-sized acts such as Zac Brown and Gov’t. Mule. But there’s way more to their picture than direct support: as Rolling Stone puts it — and I paraphrase — Blackberry Smoke made that tainted altar of Southern rock okay to like again. The Smoke has likewise incorporated icons such as Gregg Allman and George Jones into their mix, and in so doing paid some measure of homage to the greats who influence their songwriting. The Cadillac Three also performs.